Learn about what you’re made of in minutes and gain huge insights about your body, metabolism, health and fitness levels. Advanced Body Metrics provides body fat and body composition testing and rental equipment. Whether you’re a professional athlete training for an upcoming event, or you are just getting started on a journey to get fit and healthy, an in-depth understanding of your body composition is crucial. Body composition analysis is a method of describing what your body is made of, including fat, muscle, protein, minerals, and body water. With this information, you will understand in minutes the details of how your body composition is changing, from gaining muscle to losing fat. You will be able to track and assess the progress of your training or nutrition regimens with the most advanced medical and research-grade, Direct Segmental Multi-frequency Bioelectrical Impedance Analysis (DSM-BIA) body composition analyzers. See what you are made of. Within minutes, body composition testing technology will provide you with complete body fat, muscle and water composition easily, quickly, and hassle-free. This means no more inconvenient and expensive DEXA scans, water tanks or sitting in an air displacement chamber. Body Composition scans can help you reach your health, wellness, and fitness goals with meaningful data points. With full-page, in-depth results sheets you get details on your the muscle, fat, and water values of your body in minutes to help you understand, track and improve you fitness. Body composition scans will help you identify how many pounds of lean mass and fat are in each body segment. This information can be utilized to determine how a specific diet and exercise plan is affecting your body composition. 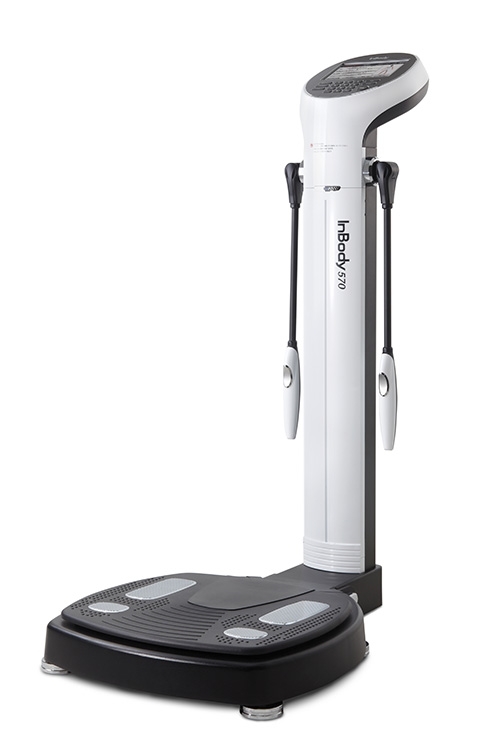 The InBody 570 offers the fastest and most convenient testing to provide you with highly accurate full body analysis results in minutes. Full body composition analyses are performed using the same accurate, precise and convenient method to measure body fat, muscle mass, water composition, as the Mayo Clinic, Cleveland Clinic, National Institute of Health, NASA, Navy Seals and more. Our equipment is used by professionals worldwide at hospitals, universities, and professional athletic teams and training facilities. We make body composition testing easy, quick and convenient. With use the premier line of research-grade, Direct Segmental Multi-frequency Bioelectrical Impedance Analysis (DSM-BIA) body composition analyzers. This latest technology in BIA provides a quick and affordable testing body composition testing alternative to dual X-ray absorptiometry (DEXA) or air/water displacement chambers. Body composition analysis is a used to describing what your body is made of, including fat, muscle, protein, minerals, and body water. Intracellular water (ICW) shows the amount of water within the cell. Body fat mass shows the total quantity of all the fat including essential and storage fats. Extracellular water (ECW) shows the total outside the cells. Dry lean mass is the total body mass minus the total body water and body fat mass. Accurate numerical values for your body weight. Skeletal muscle from increased exercise and diet modifications, is the most effective indicator of health improvements. Body Fat Mass is the total essential fats and storage fats. You’ll gain great insight into your health and training with our highly accurate body fat testing technology. The standard PBF is 15% for males and 23% for females, which are the respective midpoints of the standard ranges of Body Fat Mass in relation to standard weight (10-20% for males and 18-28% for females). Segmental Lean Analysis provides examinees with the ability to observe their Segmental Lean Mass (Right Arm, Left Arm, Trunk, Right leg, Left Leg). Segmental Fat Analysis is a derivative of the segmental lean analysis. This is presented similar to the segmental lean analysis and provides the Segmental Fat Weight value. Total Body Water is composed of Intracellular Water and Extracellular Water. Extracellular water (ECW) is the plasma water, interstitial water, transcellular water, and water found in bone, cartilage, and dense connective tissues. Intracellular water (ICW) is the water found in the cytosol of every cell in the body. In healthy individuals, intracellular fluid takes up roughly 62% of the body water, extracellular fluid takes up roughly 38% of the body water. We make body composition testing easy, quick and convenient. If you would like to set-up a location for gym, office, facility or a private event, please contact us about having an event at your location. Get in touch and see how body composition testing will help you reach your health and fitness goals.